Stuck as a Class-C hero, Saitama has his big chance to move up when a meteor threatens City Z! Saitama is a now a certified hero! The downside is that he’s stuck as a Class-C hero, requiring he perform one heroic deed per week but earning him no respect from his peers. Even more frustrating than that is the fact that Genos has risen to become a Class-S hero, completely eclipsing his “master” in terms of popularity. When Genos receives a summons from fellow Class-S hero Bang, he is shocked to find out that a massive meteor is headed straight for City-Z. With limited time, Genos and Bang valiantly attempt to stop the meteor while Saitama wanders around looking for a way to meet his quota. The story of an incredibly strong bald guy! Saitama’s latest adventure stopping a meteor delivers well on the humour, making good use of his powers and blase attitude for comedic effect even if it goes almost exactly as you would expect. While I still wish that the humour would being to venture outside of purely using Saitama as a framing tool for each joke, there was enough creativity in this volume to keep me satisfied for now. While this volume was more action oriented overall, focusing primarily on Genos and Bang as they attempted to stop the meteor, it was fairly apparent that the series relies almost completely on Saitama to bring the humour. This isn’t all that bad since the jokes starring him are so enjoyable, but I would be a little more engaged with the wider cast if they felt a little more compelling and funny with more impact on the proceedings to keep things fresh. However, the scenes while they stopped the meteor were entertaining and impressively drawn, making for an enjoyable read. One of the better parts of this volume was the immediate aftermath of the meteor disaster as Saitama walks around the ravaged city. A couple of other heroes incite a crowd to turn against Saitama, who quickly grows frustrated. One of the best elements of this series so far has been its willingness to play around with the portrayal of superheroes, exposing the way that superhero tropes play into the way we receive the story. This is mostly done in a lighthearted way when Saitama defies assumptions we might make about how superheroes should act or think. However, this volume sticks out because it does exactly the opposite in subverting the environment around Saitama to funny effect. In this case, the prominent trope of a hero receiving praise in spite of contributing to the destruction of the city being saved (hello Man of Steel!) is played with. This has interesting implications in continuing this series’ trend of making readers take notice of these types of tropes that are usually taken for granted. It also provided an excellent bit of characterization for Saitama, who shows a slightly different side of himself compared to the lightly oblivious nature he displays the rest of the time. As well as the humour is executed, this volume marks the series beginning to feel formulaic because of the lack of an overarching story to prop up the humour. The “massive problem faces city -> other hero tries to stop it and fails -> Saitama saunters over to save the day in a funny way” formula has worked extremely well and although this volume adds some interesting variations to this (as well as absolutely nailing one well-placed joke in the final pages), I’m definitely getting to the point where a more involved story would be nice. Although Saitama’s quest to move up the hero rankings is an ongoing plot point, it never really feels like a whole lot changes after each little episode. While this has worked out well so far in the series, this volume starts to run out of steam a little bit. The humour makes up for it, but I really hope that the next volume gets things moving a little bit more. The artwork in this volume continues to be remarkable, displaying the events in an appropriately epic scale. This is especially apparent in the early part of the volume when Saitama takes on the meteor, with everything rendered in vivid detail in a way that emphasizes the stakes at hand. The rest of the volume is no slouch either as once again, with ONE and Murata impressing me with their creativity as they introduce a number of memorable heroes and villians into the story, each with their own fantastic character designs. Murata also continues to do an excellent job make full use out of extremely detailed two-page spreads to emphasize the impact of various scenes, showcasing his art in an eye-catching manner. I always enjoy that each of the characters in this series are distinct looking, and although I wish that the main cast would show a few more signs of depth, this volume continues to explore unexpected sides to each of the heroes that were enjoyable to see. The last chapter in the volume primarily follows Sonic, who has been imprisonment after he previous confrontation with Saitama. It was interesting to see his prison life not only because it gave me a little more to see about what was going on outside of Saitama. Not content to leave Sonic by himself, another interesting new hero named Puri Puri Prisoner is introduced. Puri Puri Prisoner breaks out of prison at will to see people he likes, putting him on a collision course with Saitama after he hears about his exploits. I continue to enjoy how off-kilter the characters in this series are, and I’m hopeful that this as the cast grows bigger there will be a little more diversity in the sources of humour. One-Punch Man Vol. 4 is another enjoyable volume in the series, upping the stakes once again as Saitama and crew are forced to take on a meteor. This provided plenty of laughs, and the immediate fallout provided yet another interesting subversion of the superhero genre which I enjoyed for the bit of solid characterization of Saitama we get there. Although this volume doesn’t offer a whole lot to chew on in terms of its story, it’s promising that some new characters are slowly being introduced, as the reliance on Saitama being the catalyst for every joke is admittedly wearing on me even if they continue to be very well done. Overall, this volume will be sure to please fans of the series, continuing to be one of the best action-comedy series on the market today even. One-Punch Man Vol. 4 was published by Viz Media on January 5th, 2016. Based on ONE’s original webcomic, this series is authored by ONE and drawn by Yusuke Murata. The series began in 2012 and is still ongoing in Shueisha’s online Young Jump Web Comics. Volume 5 will be published in English on March 1st, 2016 and there are 10 volumes currently out in Japan. 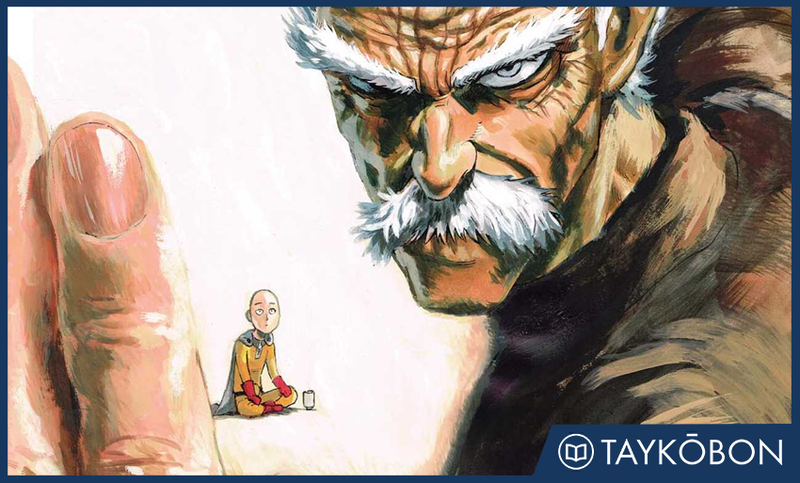 One-Punch Man was named one of our best new series from 2015, check out the rest below! We’re Taykobon, your home for reviews of manga and light novels. Be sure to follow us on twitter @taykobon for more updates and to get the latest happenings! We strive to provide timely coverage of manga and light novel releases, for a listing of every review we’ve written you can check here. For more info about Taykobon, please check here. If you’ve read this work or have any questions or comments, we would love the hear from you in the comments below!